California’s major oak species are distinguishable by canopy shape and, up close, leaf structure. They’re majestic, they’re imperiled, and they’re the most Californian of all trees. Follow our guide to see them in their spring glory. I was an Acorn. Our school was named after the oaks that carpeted my Northern California valley before the ranchers cut them down to plant fruit trees, and our yearbook was called La Encina, Spanish for live oak. It didn’t occur to me, as a teenager, that having your high school football team nicknamed after a tree’s nut might be considered odd or even a sign of weakness. Oak memories popped into my head as I walked Cosumnes River Preserve, south of Sacramento. If you want to see California oaks, this is the place: 50,000 acres with oak meadows and oak forests, oaks as far as the eye can see. And here you also begin to understand what a bad deal these majestic trees have until recently gotten. Glance at any map of California and you see how oaks have marked the state, dotting it with oak-inspired town and city names: Encino and Encinitas (the live oak again), and Paso Robles (Oaks Pass, but this time roble, Spanish for the valley oak). Then, in English, Oakland, Oak Glen, Oakhurst, Oakdale, Sherman Oaks, Thousand Oaks. Not to mention countless schools, like my alma mater, Live Oak High in Morgan Hill. For California’s Native Americans, such as the Ohlone who were the original residents of my part of the state, oaks were an invaluable source of food, which is why my fourth-grade teacher taught us how to make irredeemably bitter cookies from acorns ground into meal. Oaks also inspired Wild West legends: Not far from town, we gaped at a “hanging tree,” an oak where childhood tales had it that bandito Tiburcio Vásquez met one of his many deaths in 1875. All this makes it more peculiar that California’s oaks have not received the respect they deserve. There are national parks devoted to redwoods, to Joshua trees, even to a petrified forest. There is no national park devoted to the oak. Perhaps oaks grew in such abundance we took them for granted. Perhaps they grew in the wrong place at the wrong time, this most Californian of trees particularly vulnerable when California changed out from under them. Even after a dry winter, the green, moist signs of spring are everywhere. Valley oaks leaf out with bright, light green foliage. The day I visit Cosumnes River, I am shown around by Sara Sweet, a restoration ecologist with The Nature Conservancy, the organization that helped establish the preserve. Even after a dry winter, the green, moist signs of spring are everywhere. Valley oaks leaf out with bright, light green foliage. Wildflowers pop from oak-sheltered glades. “At Cosumnes, you see not only oak restoration but the whole rich ecosystem that oaks help create,” Sweet says. For Cosumnes is an even more complex story than it first appears. This green refuge is in part manmade—an attempt to atone for all the bad things we’ve done to oaks over the past 150 years. Almost as soon as American settlers arrived in California, they began chopping oaks down. 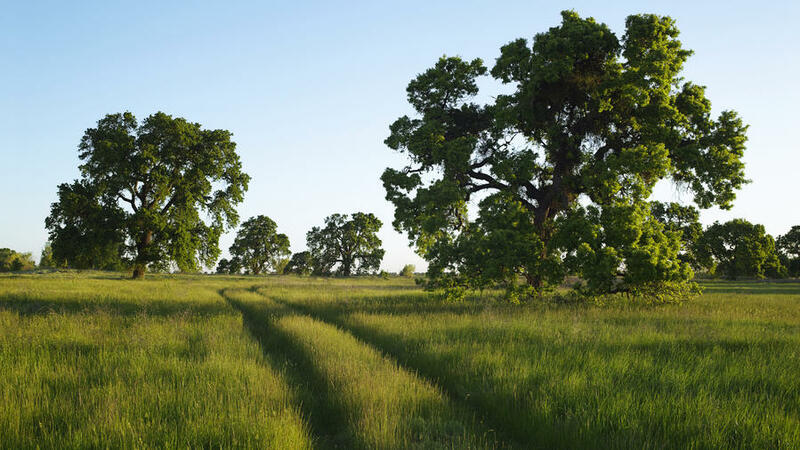 In the 19th century, farmers cleared oak woodlands to make way for crops and grazing; by 1900, an estimated 90 percent of the oak forests that edged the Central Valley’s rivers had been destroyed. In the second half of the 20th century, suburban development from the San Fernando Valley to the Sacramento Valley reduced the oak population even more. Biologists estimate that more than a third of California’s original millions of acres of oak woodlands has been lost. And the California Oaks organization estimates that another 750,000 acres of oaks are at risk in the next 30 years. The bulldozer isn’t the only threat. Sudden oak death, a pathogen first detected in 1995, has now spread through oak forests of Northern and central California, killing more than a million oaks of several species and infecting at least another million. At Cosumnes, Sweet explains, biologists essentially created new oak woodland from former farmland. They pulled out levees and roads and planted thousands of new oak trees. They allowed the Cosumnes, the last unregulated river to flow freely from the Sierra Nevada to the Central Valley, to meander in its historic path across the land, its floodwaters depositing silt to build the deep rich soil that encourages extra-large oaks. As we stroll near the Cosumnes River, Sweet says we’ve entered valley oak riparian habitat, once widespread through California, now reduced to scattered patches. Biologists consider this habitat California’s most diverse in terms of the animal life it supports. Wrentits dart from tree to tree so quickly they’re almost invisible—only their trilling gives them away. Newly emerged tiger swallowtail butterflies flutter at eye level. Sweet notices an oak titmouse with, she says, “an adorable feather crest on top of its head.” A beaver in a slough noses out of the water, trailing a gentle wake. It’s an amazing sight, but not the most amazing of all. That comes near the end of the trail’s loop, where we emerge into open space, 70 acres of green grassland, a savanna of widely spaced, mature trees, many reaching 60 feet tall, gnarled and weathered, separated as if each had staked out its own territory: an arboreal Gothic cathedral indeed. There’s no oak national park, but we have this. Sweet spots two white-tailed kites perching on a branch, then hovering as they hunt for rodents below. The birds were once nearly extinct in California, but here they seem perfectly at home, reunited with their ancient oak companions. Looking at the scene, I decide that being an acorn is no bad fate after all. Bidwell Park, Chico: Oak woodlands (of 7 species) spread across one of the country’s largest city parks. At One-Mile Recreation Area, along Big Chico Creek, valley oaks reach more than 100 feet tall. bidwellpark.org. Cosumnes River Preserve, Galt: South of Sacramento, valley oaks in dense forest and meadows; 4.5 miles of trails. cosumnes.org. Kaweah Oaks Preserve, Visalia: Just off State 198 (and a good stop on the way to Sequoia N.P. ), near-pristine forests of valley oaks. sequoiariverlands.org. Peter J. Shields Oak Grove, UC Davis Arboretum and Public Garden, Davis: A grand collection of 100 types of oaks, including 8 California species plus many others from around the world. A cool stop on I-80. arboretum.ucdavis.edu/oak-collection.aspx. Malibu Creek State Park, Calabasas: Trails in this Santa Monica Mountains park lead to savannas studded with coast live and valley oaks. $12/vehicle; malibucreekstatepark.org. Oak Glen Preserve, Oak Glen: Known for its apples, The Wildlands Conservancy’s preserve at the base of the San Bernardinos also showcases oaks. wildlandsconservancy.org/preserve_oakglen.html. The Santa Barbara Botanic Garden, Santa Barbara:The Woodland Trail shows coast live oaks nurturing a rich community of plant life (lemonade berry, toyon). $10; sbbg.org. Santa Rosa Plateau Ecological Reserve, Murrieta: A nearly 10,000-acre reserve noted for its Engelmann oaks, found mostly in parts of San Diego and Riverside Counties. $3; rivcoparks.org.